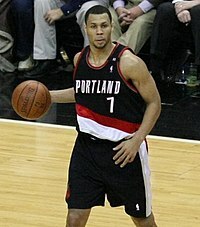 Brandon Roy (born July 23, 1984 in Seattle, Washington) is a retired professional basketball player. He played for the Portland Trail Blazers of the National Basketball Association (NBA) from 2006 to 2011. He won the NBA Rookie of the Year Award in 2007, and was chosen as an All Star in 2008, 2009, and 2010. Roy played college basketball for four years at the University of Washington. The Minnesota Timberwolves chose him with the sixth pick in the 2006 NBA Draft, but traded him to the Trail Blazers later that night. On December 9, 2011, Roy said that he would retire from basketball because of knee problems. ↑ Raley, Dan; Reporter, P.-I. (29 June 2006). "Brandon's a Blazer". seattlepi.com. ↑ Freeman, Joe (December 9, 2011). "Brandon Roy retires after doctor tells Trail Blazers guard that long-term health risk is too high | OregonLive.com". oregonlive.com. Retrieved December 10, 2011.